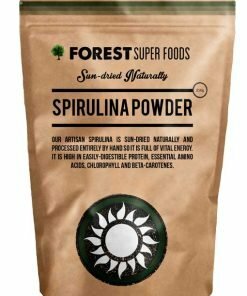 Grown naturally and dried by the sun in Auroville, India, our Spirulina has a pleasant taste and is packed with 60% bio-available protein. Spirulina has large amounts of iron and beta-carotene (helping to keep eyes and skin healthy). Spirulina is great for detoxing as it chelates heavy metals from the body and is known to reduce bad cholesterol.